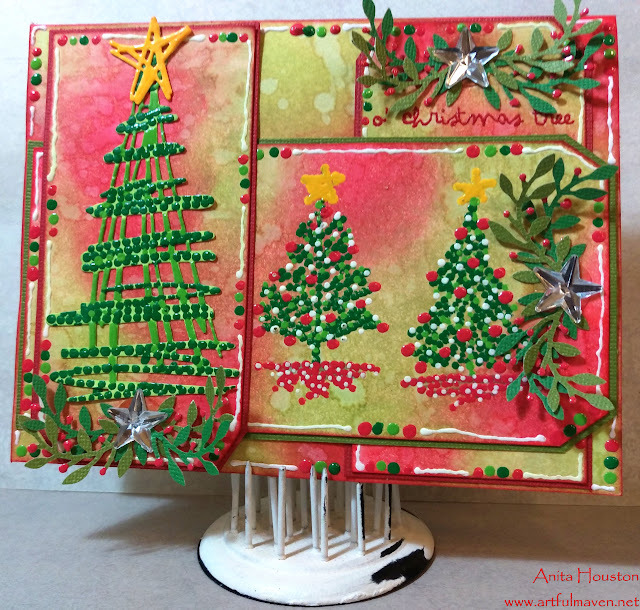 Hello and welcome to the last Monday in November, which means December is right around the corner...yikes, and which means it's time for a new challenge at Simon Says Stamp's Monday Challenge Blog, and which means it's also my last project as Guest Designer for this month. It's a little sad as it's been so much fun. I truly thank you all for the wonderful comments this whole month, and for all the inspiration from your projects...WOW! Thank you Simon Says Stamp for having me, it's been an honor. 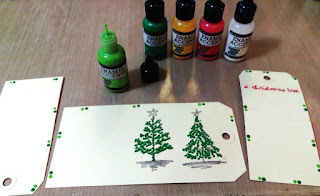 This last November challenge is "O' Christmas Tree"....so perfect for the upcoming Christmas holiday, and a good reason to start working on your Christmas projects if you haven't already. The day will be here before we know it...yikes! For my project I decided to finish out a tag I started from my Ranger Enamel Accents and Liquid Pearls Video, and turn it into a card featuring three different Christmas trees. 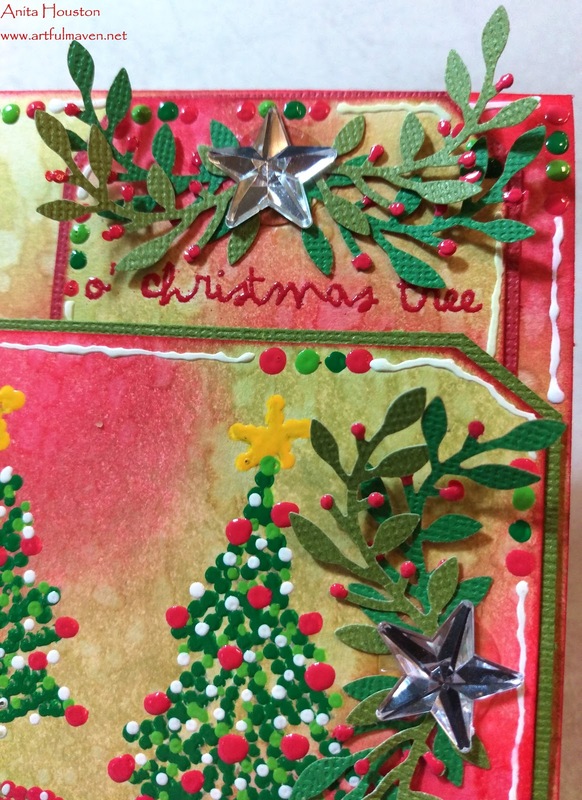 This is an easy card to make. 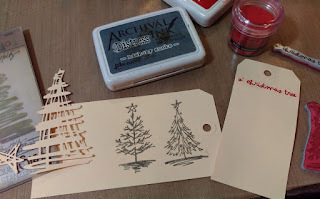 Begin by stamping two of Tim's Scribbly Christmas Trees from Stamper's Anonymous, onto the right side of a #8 Manila Tag from Ranger, in Hickory Smoke Archival. 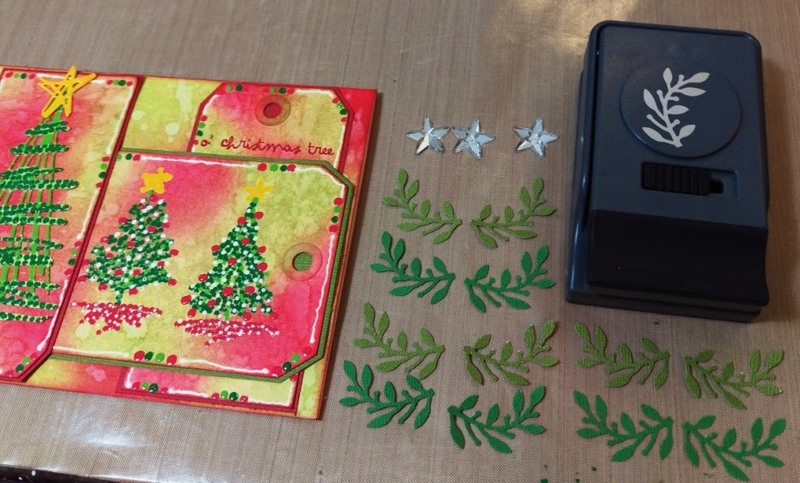 Die cut Tim's Sizzix Thinlet Festive Scribbles Christmas Tree and Star (the small one) using Manila as well. 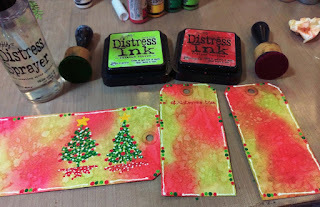 Stamp the sentiment in Red Geranium Archival Ink from Wendy Vecchi, and pour the same color Embossing Powder on it and heat emboss it onto a small #5 tag. Starting with one color at a time, make dots using the Enamel Accents and cover up the stamped images with it. Also make dots around the edges of the tag to make a border. 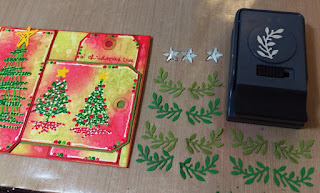 Make dots on the die cut pieces as well, covering them up as best as you can. 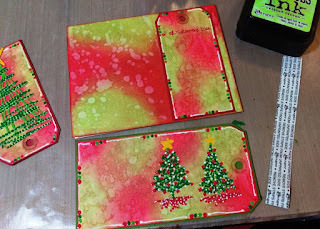 Add a Fine Tip Applicator to the Glacier White Enamel Accents, and make smaller dots and thin lines around the border. Once all the Enamel Accents are dry, ink over all the tags with Festive Berries and Twisted Citron Distress Ink. Then flick water onto them to make water spots. The Enamel Accents resist the ink...even the white. Ink a card base the same way. 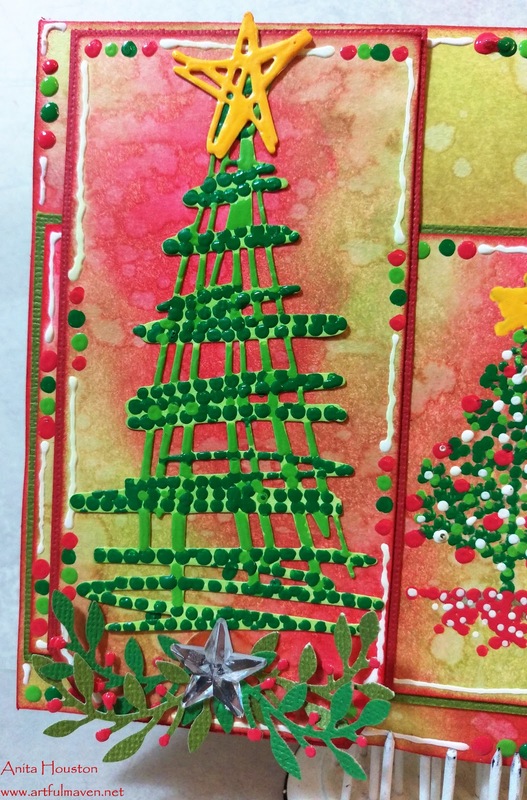 Ink the edges of the tags with Festive Berries, and layer them onto the card base with Adhesive Strips. Punch out the Laurel Sprigs using cardstock, and add Classic Cherry Enamel Accents to the berry portions. 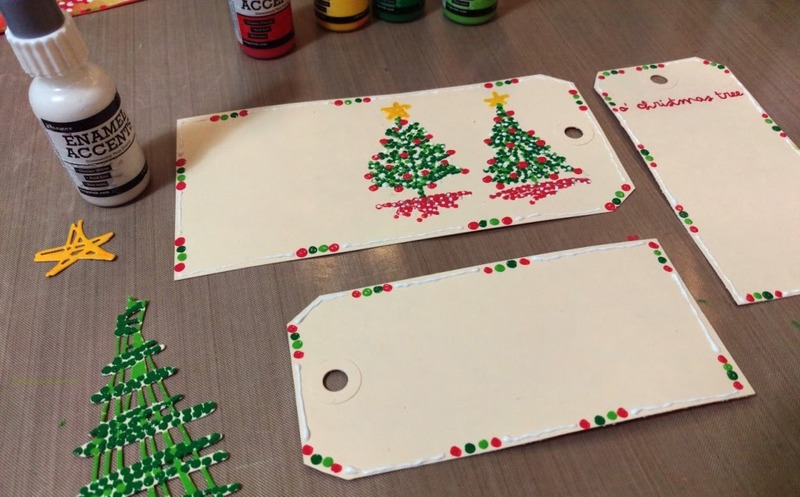 When dry, adhere them around the holes of the tags and add Mirrored Stars. Edge the card with more Enamel Accents. Thank you again for coming by and visiting! 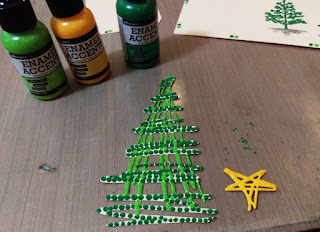 I hope you join along in this festive challenge. You might just be the one who wins a $50 gift certificate to Simon Says Stamp!!! Good luck, and I look forward to all your festive entries! Ranger Fine Tip Applicator for .5 oz. This is beautiful, Anita! 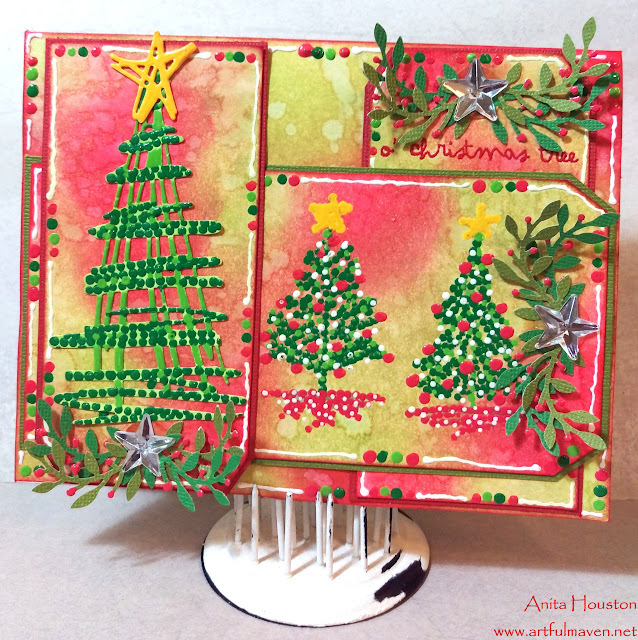 I love the bright colors and all the fabulous Christmas trees. Amazing! The background is amazing at how it makes your tress pop. I think this is my favorite scribbly tree. The enamel accents give it so much more dimension (along with the background). 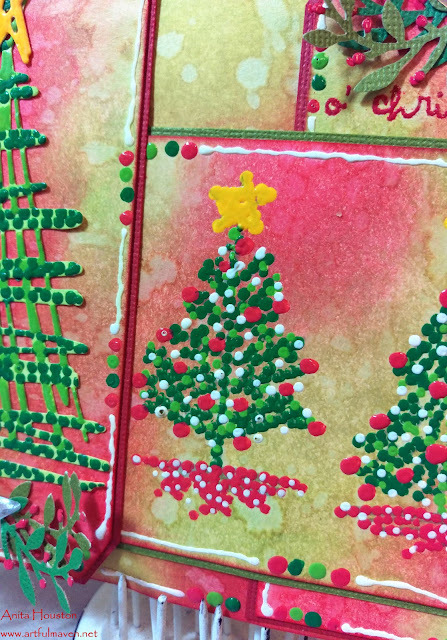 We are glad you've been a guest designer because your projects are so inspirational. Love it! 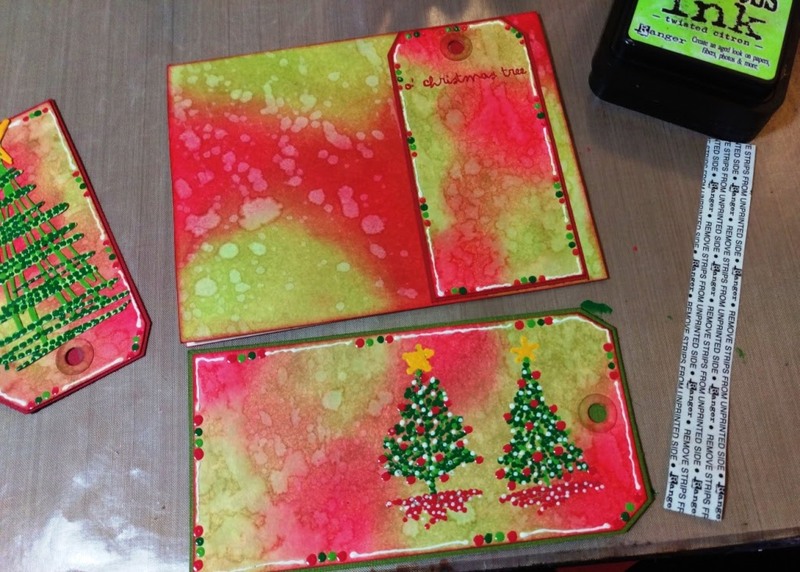 I have never worked with the Enamels before. Wonderful project! So inventive! The combination of colors and trees are super. All your creations for SSS are brilliant! Anita, what a fantastic card! I am in love thank you for sharing with us your steps! 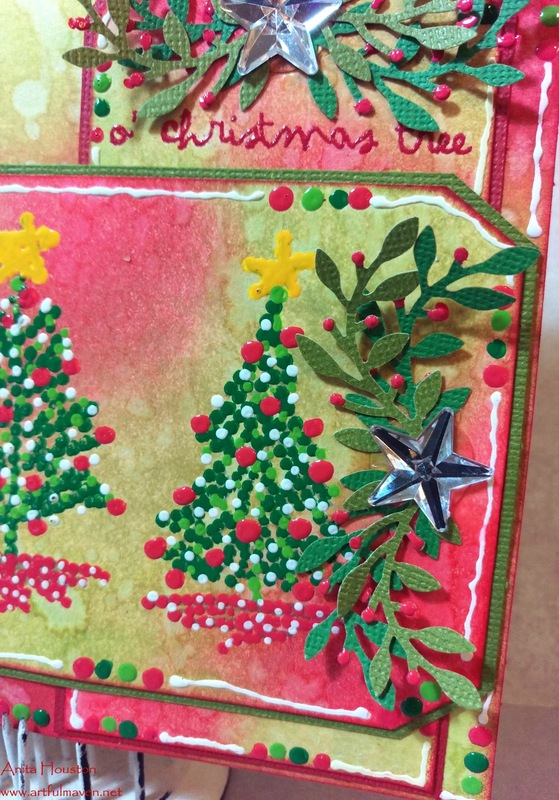 Love the way you used enamel accents! I have enjoyed seeing all your projects for Simon this month and this one is a favorite. I appreciate the playfulness of the design and colors. I am a BIG fan of Liquid Pearls, I've never tried the Enamel Accents and didn't know they came in colors so thanks for the heads-up. Have a happy holiday! What a fabulous finale to your spotlit month - your trees look so funkily cool... but I'd expect nothing less here! I know I've got lots of lovely catching up in store - to see the rest of your SSS projects, never mind the other treats I must have missed. I'm looking forward to having some proper catching up time over the festive season. what a piece of art! so pretty! This is such a cool piece of art! 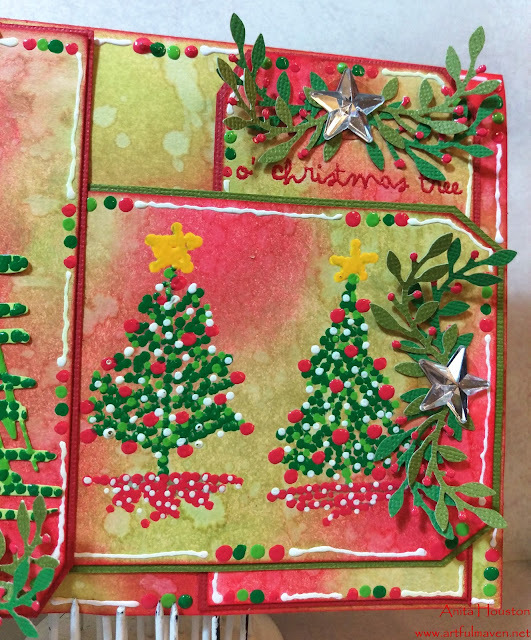 I am loving the way you used all of the enamel accents to create texture. It reminded me of one of Seurat's gorgeous paintings where the dots form all sorts of images. 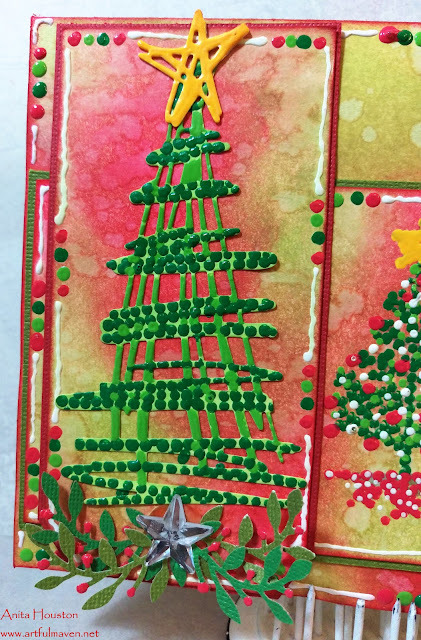 You did a great job on this and I have enjoyed you being on our Simon Says Stamp Design Team so much! I love the contemporary feel of this project and adore the way you've used enamel accents to add texture...this is just a wonderful work of art Anita and it's been an absolute pleasure to have you as our GD this month and I've loved every minute of seeing your beautiful work! 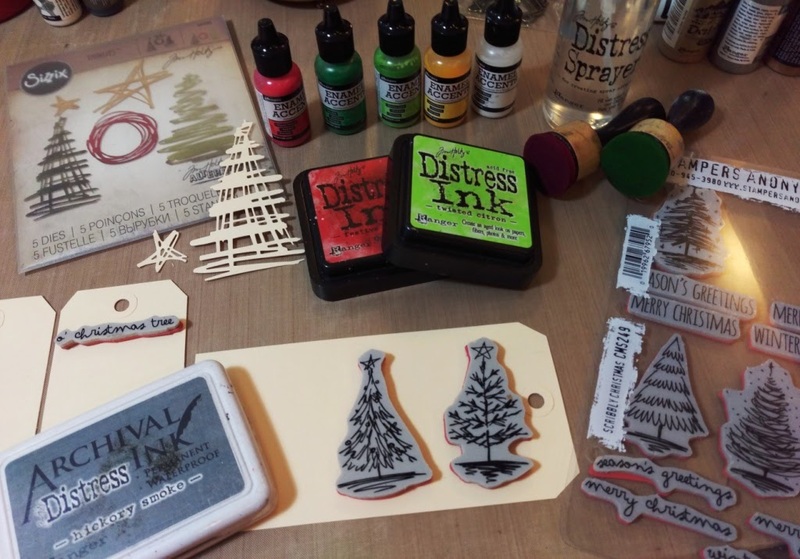 Oh Christmas Tree! 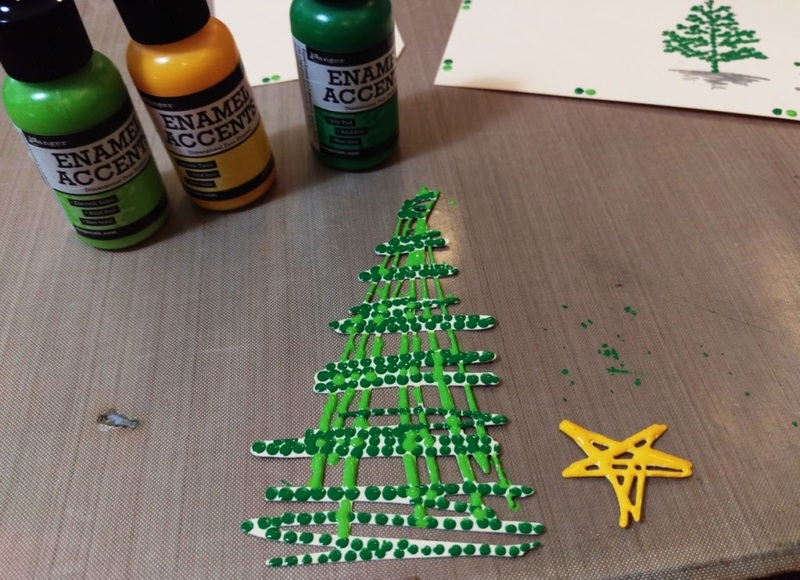 Anita, I am so loving your enamel dotted Christmas trees which is so fun and different! Love it!